How To Get Mobile Version Of A Page Recognized By Google? 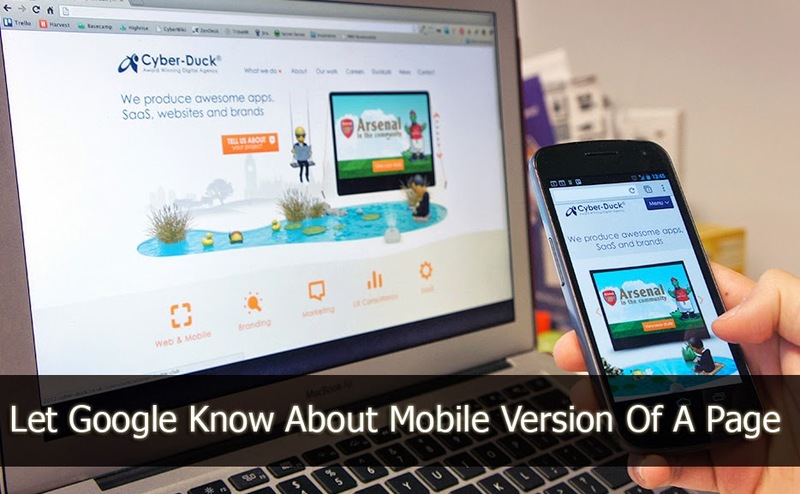 There are many ways you can optimize your website to handle mobile traffic. You can have responsive web design, dynamically serve content, or maintain a separate mobile site altogether. But how do you tell Google about this mobile version of a page, so that it can be shown in mobile search results? Users searching Google on a smartphone should ideally see mobile sites instead of desktop sites. So how exactly do you go about telling Google about the mobile version of a webpage? As I mentioned, there are three basic ways to handle mobile traffic. Responsive web design - Webpages 'respond' to the user agents, and re-size and readjust automatically to best suit the user agent that requested a page. Dynamic content serving - Less used, but useful technique similar to RWD. The type of user-agent is recognized, i.e. whether it is a mobile or a desktop agent, and then content is programatically. Separate mobile site - Same content, but hosted on a separate domain or sub-domain. Usually m.website.com. Another way to do this is to have separate versions of a page for desktop and mobile users having separate URLs. To let Google know about the mobile version, follow these simple steps. Step 1: On your desktop page, use a rel="alternate" tag pointing to the mobile version. This lets Google know that these two versions of the same page are related to each other because this is the desktop version, and the other is the mobile version. Step 2: On the mobile page, do a rel="canonical" to the desktop version. This tells GoogleBot that even though this version has a different URL, the content is the same. These bi-directional links will help Google establish a relationship between the two versions of a page, and understand the difference between them. The last step is to make sure that you are properly redirecting smartphone users from the desktop to the mobile version. This redirection tells Google a webmaster has set up a mobile version of a site, and is redirecting smartphone users to it. Also make sure you're not blocking GoogleBot on any version of your page(s). Following these best practices, you can help Google correctly identify mobile versions of your page, and serve them in mobile search accordingly.